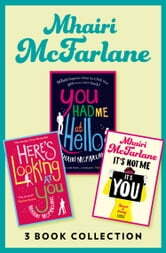 Three hilarious novels from the SUNDAY TIMES bestselling author YOU HAD ME AT HELLO: Rachel and Ben. Ben and Rachel. It was them against the world. Until it all fell apart. It’s been a decade since they last spoke, but when Rachel bumps into Ben one rainy day, the years melt away. They’d been partners in crime and the best of friends. But life has moved on: Ben is married. Rachel is not. Yet in that split second, Rachel feels the old friendship return. And along with it, the broken heart she’s never been able to mend. Hilarious, heartbreaking and everything in between, you’ll be hooked from their first ‘hello’. HERE’S LOOKING AT YOU: Anna Alessi – history expert, possessor of a lot of hair and an occasionally filthy mouth – seeks nice man for intelligent conversation and Mills & Boon moments. Despite the oddballs that keep turning up on her dates, Anna couldn’t be happier. As a 30-something with a job she loves, life has turned out better than she dared dream. However, things weren’t always this way, and her years spent as the ‘Italian Galleon’ of an East London comprehensive are ones she’d rather forget. So when James Fraser – the architect of Anna’s final humiliation at school – walks back into her life, her world is turned upside down. But James seems a changed man. Polite. Mature. Funny, even. People can change, right? So why does Anna feel like she’s a fool to trust him? IT’S NOT ME, IT’S YOU: Delia Moss isn’t quite sure where she went wrong. When she proposed and discovered her boyfriend was sleeping with someone else – she thought it was her fault. When she realised life would never be the same again – she thought it was her fault. And when he wanted her back like nothing had changed – Delia started to wonder if perhaps she was not to blame… From Newcastle to London and back again, with dodgy jobs, eccentric bosses and annoyingly handsome journalists thrown in, Delia must find out where her old self went – and if she can ever get her back.